When it comes to looking after my skin, along with looking for products that target blemish-prone skin, oiliness and shine, pore products always sit highly on my list of 'must haves'. Having oily skin means that my pores are really visible, which is a really big bugbear when you're lusting after that flawless, airbrushed look. Whilst some foundations do a great job of covering those pores up, I always look to my skincare (along with a couple of makeup goodies) to help improve the appearance of my pores instead of just concealing them. Luckily for me, there are a lot of pore-targeting products out there, most of which I've tried and found to be really successful. This being the case, I thought it was about time I put together a post focusing on the pore products that work a treat at minimizing, refining and correcting enlarged pores. First up, I couldn't kick off this post without featuring one of my ultimate favourite pore-vanishing products; Porefessional from Benefit. Although this is predominantly a makeup primer, it works really well alone to banish the appearance of pores and give the skin a gorgeous, air-brushed , 'soft focus' effect. If I ever can't be bothered to wear makeup, I whack some of this on as it instantly gives me a more flawless, poreless complexion. It's a must-have if you are looking for the ultimate pore-vanishing primer. Sticking with makeup-type products that help banish pores, another primer-esque product that I am in love with is DHC's Clarifying Pore Cover Base*. This works in a similar way to Porefessional, as it is used under makeup to prime and prep the skin,whilst smoothing the appearance of pores. It keeps shine at bay and makes your makeup last longer. I'd definitely say it is on par with Porefessional, which is a big deal in my eyes. Definitely another product that is worth investing in if you want poreless-looking skin - but I'd choose one or the other as they both have almost the exact same function. 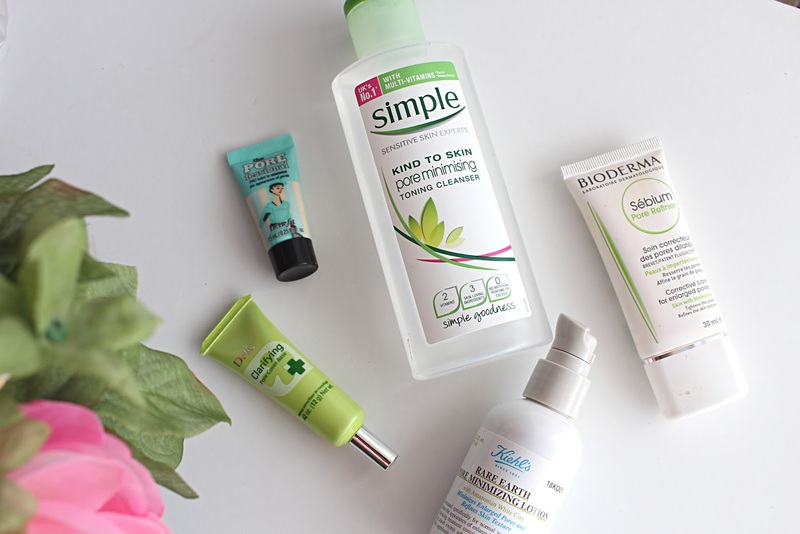 Moving onto more skincare-based pore products, Simple's Kind to Skin Minimising Pore Toning Cleanser (woah, wasn't that a mouthful?!) is a great budget product that claims to reduce the appearance of pores. I'm not one hundred percent convinced that this does do much for my pores, but I have noticed a slight difference through using it. I also really like the gel-like formulation of this cleanser/toner, and as I'm a big fan of Simple products it gets a big thumbs up from me. It's less than a fiver to buy so worth a try if pores are getting you down. In the pricier end bracket of pore products, Kiehls Rare Earth Pore Minimizing Lotion* is a firm favourite of mine. I'm really new to Kiehls products but I'm absolutely loving them so far, and this little lotion is a great pore-minimising product. The oil-free lotion is rich in minerals and Amazonian White Clay to smooth the skin and reduce the appearance of pores. The lotion is super lightweight and feels gorgeous on my skin, and I have definitely seen a difference in the size of my pores when using it. It's definitely pricey at £26, but a little goes a long way and I can see a bottle of this stuff lasting me ages. Finally, in the mid-range price bracket my pore product of choice has got to be Bioderma's Sebium Pore Refiner. Another product that works to both minimise pores and reduce sebum and shine, this 'correcting concentrate' utilises Bioderma's patented 'Fluidactiv' complex to keep the production of sebum down, whilst also unblocking pores and keeping breakouts to a minimum. I sometimes use this as a primer or I'll pop it on at night to keep my pores in check. I really like it and it's currently reduced to £9.86 on Escentual, normally retailing at £14.80. What are your go-to pore-minimising products? Let me know if you use any of the above, and what you think!